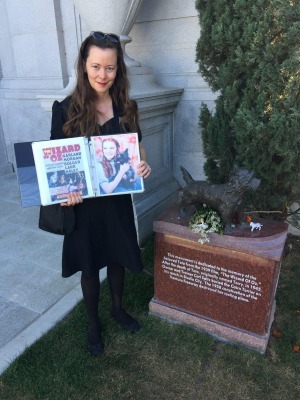 "People are really drawn to stars who die young," says Karie Bible, guide on the Cemetery of the Stars Tour. "They never grow old, or lose their looks, or make bad movies." Her point is illustrated by the crypt we're standing next to: that of Rodolfo Guglielmi Valentino, 1895-1926. Better known as Rudolf Valentino, he was the first great Hollywood star of the silent movie era. For years after he died, a mysterious woman in black visited his crypt here at the Hollywood Forever cemetery, placing a single red rose. Bible has adopted that legend, dressing in black for her weekly tours of the place where so many famous actors and directors have been laid to rest. She lays no claim, however, to the numerous red marks left on the marble of Valentino's crypt. "None of that lipstick belongs to me," she says. "It leaves stains." Outside in the sunshine, Bible's funereal garb contrasts with the beautiful grounds. Opposite the mausoleum is a lake, whose grassy shores are dotted with graves and memorials. One of the most recent graves is that of Johnny Ramone, who died in 2004. A statue of the musician, posed with guitar in hand, is surrounded by flowers. Nearby is a memorial to Hattie McDaniel, who played the maid in Gone with the Wind. It's hard to believe that this attractive place was in an awful state in 1998, when its long-time owner, Jules Roth, passed away. "He was a gangster and a white collar criminal, and he ran this place into the ground," says Bible. "It was falling apart, on the brink of being closed down. If that had happened, it would have meant a padlock on those front gates up there." Luckily, a white knight appeared in the form of a Missouri-based funeral company. Renamed as Hollywood Forever (formerly the Hollywood Memorial Park Cemetery), the cemetery has been impressively repaired and landscaped. It's also become an unconventional entertainment venue. From May to December there are concerts and movie screenings on the Fairbanks Lawn, next to the tomb of 1920s film star Douglas Fairbanks. "We've had Annie Lennox here, Lana Del Rey, a lot of major music stars," says Bible. "We had the series finale of Breaking Bad here. We also have one of the largest Day of the Dead parties in America." Is this activity disrespectful to the dead? Karie shakes her head. "I see it as a celebration of life … a community space for the living as well as the deceased. We celebrate life, we celebrate the arts. It's very artistically run, for a cemetery." There are more departed greats to pay homage to, as we walk: Mel Blanc, the voice of Bugs Bunny; directors John Huston and Cecil B. DeMille; actor Mickey Rooney; and Vampira, presenter of horror movies on TV. However, I'm most moved by a 2011 memorial for Toto, Dorothy's dog in The Wizard of Oz. Toto's actual grave was destroyed in 1958 by the construction of a freeway. That seems symbolic of Los Angeles, where the past is always making way for the next big thing. But not here, at least, where legends live on. The Cemetery of the Stars Tour takes place at 10am each Saturday at Hollywood Forever, 6000 Santa Monica Blvd, Los Angeles. Tickets $16, see cemeterytour.com. The writer was a guest of United Airlines and the Los Angeles Tourism and Convention Board.